Wash mushrooms and stuff the cheese into the mushrooms and sprinkle them with some paprika. Turn on oven at 350 degrees. 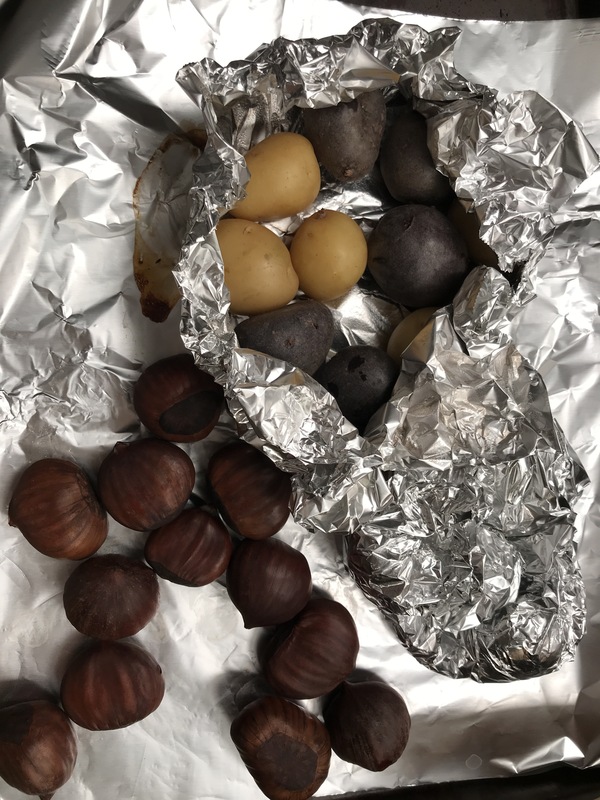 After the oven is heated, put stuffed mushrooms, potatoes (wrapped in aluminum foil), and chestnuts no a baking sheet. Put the timer on and bake it for 25 min. Heat up a medium size pan and put in 2 table spoons of oil (clarified butter, olive oil, or coconut oil). When it is hot, put in salmon over medium high heat. Brown each side until both turn golden brown. Then add a table or two spoons of vinegar, one or two teaspoons of sugar and a small table spoon of chili paste and add chopped green onion. Then turn down to the low heat and cover the pan and cook until the inside is all cooked. It should take only about no more than five more minutes to cook the inside. Add salt and pepper to your taste. I usually cook salmon with ginger and garlic but I did not have it today. I used green onions instead today. This time I cooked salmon with Trader Joe’s clarifier butter and it turned out delicious. The spinach is quite simple. You just stir fry it with oil and sprinkle it with salt and pepper at the end of cooking. If you have garlic, add it into hot oil before you stir fry spinach. 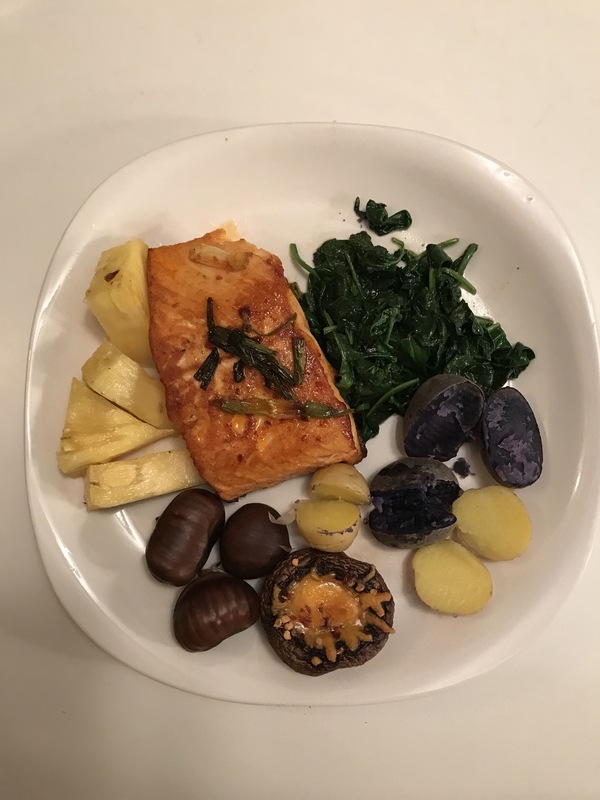 I love baked chestnuts and the small potatoes in different yellow, purple, and red colors. I feel healthy after eating this tasty meal! This meal altogether takes only 30 minutes and you can eat a five-star healthy meal! From now on I am going to bake more chestnuts for my meal and snack. When it is hot from oven, it is easy to bite into it. However, when it gets cold, it gets hard. You may need a tool to crack it open. Chestnuts are so yummy and contain less fat than other types of nuts.